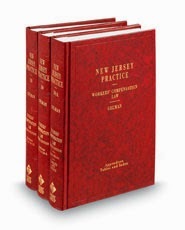 Workers Compensation, Gelman, West, Proview,eBook, PROVIEW, Thomson Reuter, NJ Practice Series Now you can have Workers’ Compensation Law, 3d (Vol. 38-39A, NJ Practice Series, available conveniently on your mobile device with PROVIEW. Now you can have Workers’ Compensation Law, 3d (Vol. 38-39A, NJ Practice Series, available conveniently on your mobile device. Stay current with all the exclusive West-Thompson Reuters information contained in the hard bound edition, and supplements, available at your fingertip with even more power. Never be at a loss for information, analysis or data in Court, in the office or on-go. Thomson Reuters ProView is a professional-grade eReader app for eBooks on your desktop, laptop or tablet. This free app lets you access your most trusted legal references anywhere your work takes you. Find the nugget of information you're looking for in one simple search across all your downloaded eBooks. For more information and to order the ProView edition click here.